Many of you know that I love hearts! I love the shapes and all of the possibilities. This heart-shaped etui is another example of my class Log Cabin Heart Etui and Pincushion. It was featured as a gallery example in The Embroidery Book. Many of you know that I love hearts! I love the shapes and all of the possibilities. 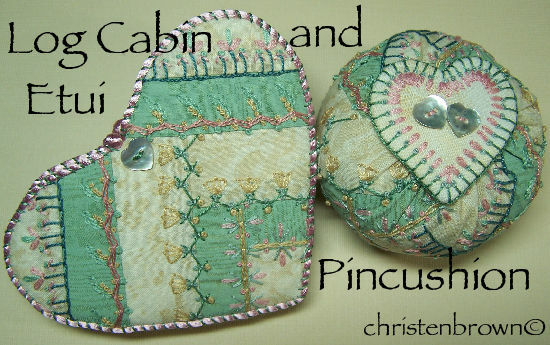 These fun sewing aids are from my class Log Cabin Etui and Pincushion. The set includes directions for piecing a log cabin base for an etui (needle holder) and pincushion. The pincushion has a heart shaped top, and both have heart shaped buttons. The embroidery stitches include: chain, herringbone, zigzag chain, blanket and short-long-short blanket, fly, lazy daisy, closed buttonhole flower, curved open chain loop, and the French Knot stitches. This is a very traditional project, with a contemporary flare. The heart shaped etui and base of the pincushion are both pieced with a version of the Log Cabin technique. The pieced sections are embellished with traditional embroidery stitches using two different types of thread, perle cotton #8 and 6-ply stranded floss. These make an excellent gift for any sewer! Lesson 1: In this class you will be piecing the base for both the etui and pincushion using a variation of the Log Cabin piecing technique. You will also form the decorative center of the pincushion. Lesson 2: In this class you will embroider the base stitches across the seams, these include: chain, herringbone, zigzag chain, blanket and short-long-short blanket stitch. Next you embroider the decorative stitches to the base stitches, these include: fly, lazy daisy, closed buttonhole flower, curved open chain loop, and the French Knot. You will also embroider the center of the pincushion. Lesson 3: In this class you will assemble all of the pieces and parts of the etui and pincushion. These classes can be purchased at any time, there is no set schedule.The class can be ordered by contacting Christen: thestoreonthecorner@gmail.com. She will send you an invoice through PayPal. Once the class is paid for, the supply list will be sent out. The lessons will begin one week after the purchase of the class, unless otherwise stated. You will receive an email with the lesson attached. The following lesson/s will arrive one week after the previous lesson. A high speed internet connection is recommended, and you must have basic computer and internet skills. You will need to be able know how to download and save a document to your computer’s hard drive, open it and print out a copy. You can contact Christen with any questions pertaining to the class/class information throughout the length of the class. Class fees will not be refunded.